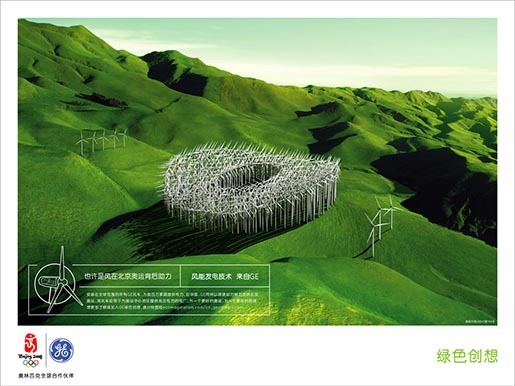 GE is connecting environmental technology with the Beijing Olympics in a print advertising campaign, using the phrase, “For the good of the Games, for the good of the planet. To learn more about ecomagination, please visit ecomagination.com”. Rice paddies are retouched as race lanes. Sometimes success is measured in green not gold. Technology from GE. Advanced technologies from GE are helping to provide cleaner energy to the Olympic Games, lighting at Olympic events, clean recycled water for the National Stadium, and GE’s efficient aircraft engine is helping to provide transportation of athletes and people from around the world to Beijing. A windfarm is retouched to become the Bird’s Nest stadium. May the wind be at your back at the 2008 Beijing Games. Wind Energy from GE. Together all the GE wind turbines in the world could produce the energy needed to power millions of homes. 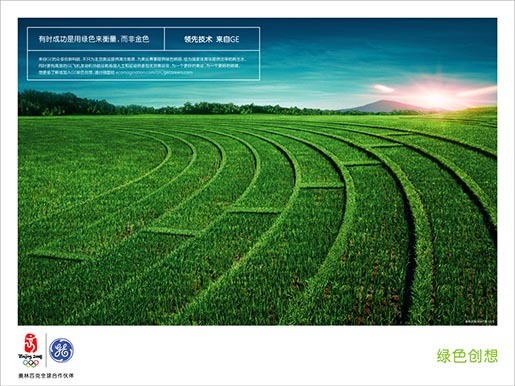 In China, GE supports the Beijing 2008 Olympic Games with sustainable energy sources in power plants which are providing electricity to the Olympics Central Area. Lotus lined swimming lanes lead to an island. Creating a clean path for the 2008 Beijing Games. 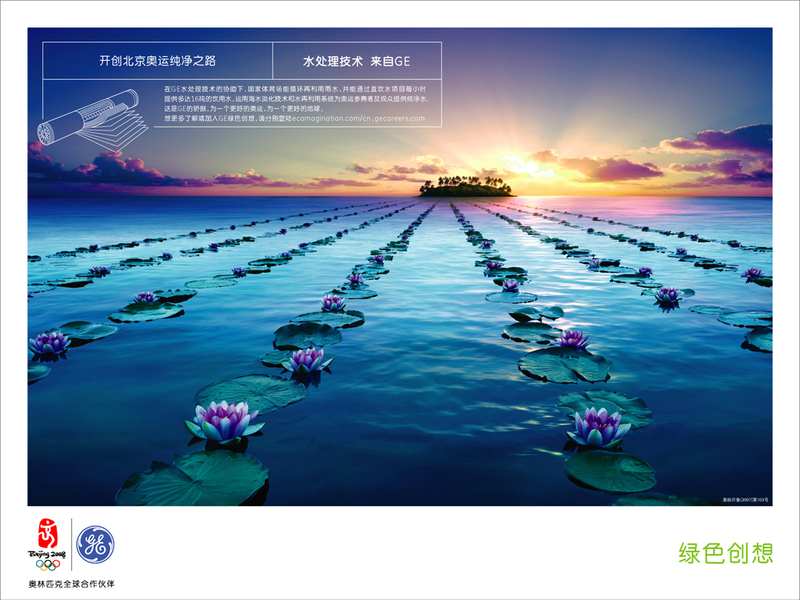 Water Technologies from GE. Supported by GE Water Technology, the National Stadium can recycle rainwater and provide 16 tons of drinkable water per hour. GE is proud to bring water purification and reuse systems to the Games, and provide clean water to athletes and spectators. 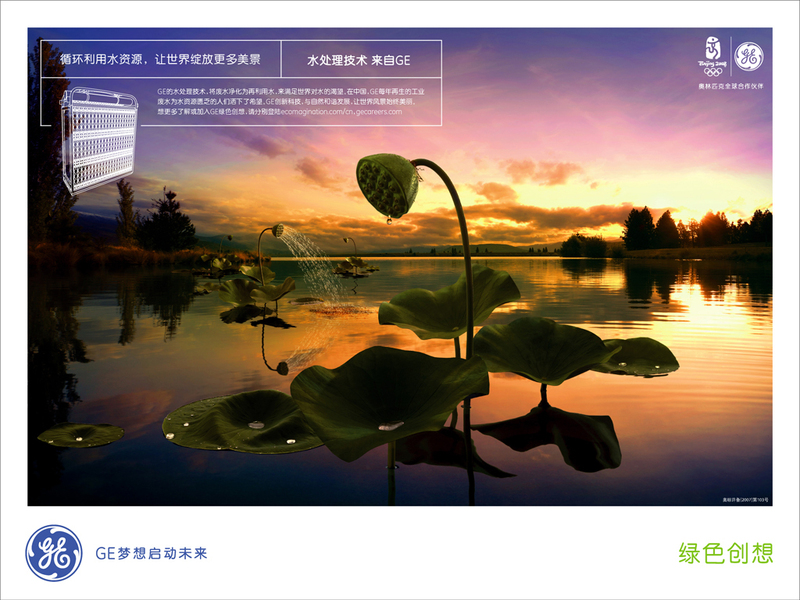 A water lotus is retouched to appear as a shower and green turtles. Reusing water in order to make the world bloom. 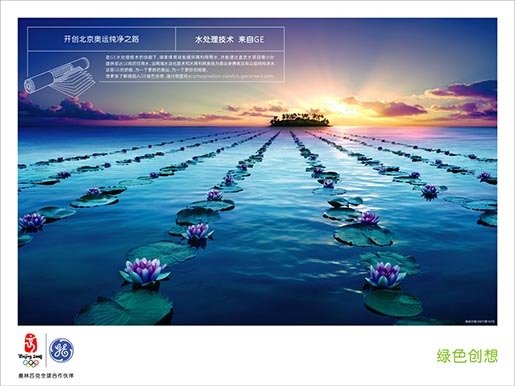 Water Technologies from GE. The Olympics campaign was developed at BBDO China, with photography by Chris Lewis retouched at The Lounge.